"There's a lot of space out there to get lost in." The preview trailer for Lost in Space contains virtually no dialogue or human interaction. It consists of a variety of effects shots featuring space flights, alien battles, and explosions. The trailer should promise an entertaining ride, but even all the action lacks life and energy apart from a few impressive special effects. This is a bad sign. The original Lost in Space television series aired before my time, but I have heard about its popularity and basic concept. Some of the major stars play cameo roles in this film, but it takes a much different route than the camp of the original series. Dr. John Robinson (William Hurt) is a mellow father who struggles to find time for his family while trying to save the planet. The prime conflict exists between John and his son Will (Jack Johnson), a young genius who only desires his father's attention. The story tackles this theme concerning the relationship between fathers and sons, but it never really comes together. The characters just are not drawn deeply enough to explore anything beyond their superficial family connection. The central plot focuses on the search for Alpha Prime, a new planet to house the residents of Earth. Our planet has used up almost all of its fossil fuels, and humans must leave as soon as possible. John Robinson will journey to Alpha Prime to oversee the creation of a Hypergate, which functions as the gateway between the new planet and Earth. John's one condition is that he can bring his family along on the lengthy trip. So he packs up the ship with wife Maureen (Mimi Rogers), unfeeling Judy (Heather Graham), rebellious Penny (Lacey Chabert), Will, pilot Don West (Matt Leblanc), and the robot. Unfortunately, the evil Dr. Smith (Gary Oldman) sabotages the ship, and they become lost in space. Amidst all of the script problems and expensive effects, the talented ensemble cast does a decent job. William Hurt appears a little out of place in a special effects epic, but he does add some much-needed relevance to the father-son relationship. Jack Johnson is a talented child actor, and exists on another strata from feeble Jake Lloyd of The Phantom Menace. The real surprise is Friends'Matt Leblanc, who gives arguably the film's strongest performance as the straight-arrow Major Don West. Gary Oldman receives most of the film's best lines, including "I'm a doctor, not a space explorer," but he remains fairly low-key and in the background. Mimi Rogers, Heather Graham, and Lacey Chabert all deliver solid performances as the female members of the family. 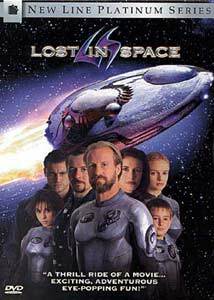 Lost in Space provides entertainment on a basic level that probably would appeal to children. But it tries to accomplish more with a darker tone and a complex final act. The actors give it their best shot, but the story fails to move the film above mere eye candy. The effects provide an adventure for the eyes, but not for the mind. Image Transfer Review: New Line has done a wonderful job with this 2.35:1 anamorphic widescreen transfer of the film. It features well-defined and bright colors, deep blacks, and a clear picture. I noticed few visible artifacts on this excellent transfer, although one scene featuring the Blorp is surprisingly dark and grainy. This is probably a CGI effects problem instead of a glitch in the transfer because it occurs nowhere else in the film. Audio Transfer Review: An exceptional 5.1 Dolby Digital soundtrack heightens the impact of the countless action scenes of space travel, explosions, and guns firing. The rear speakers provide plenty of depth to the sound mix, especially during the furious spider battle and subsequent explosions. The launch of the Jupiter spacecraft also provides a booming sensory experience. The cast bios of William Hurt and Mimi Rogers include scenes from Dark City and Austin Powers, respectively. Extras Review: New Line always packs their Platinum Series DVDs with extras, and Lost in Space ranks with Austin Powers and Dark City as one of their most comprehensive releases. It requires countless hours to navigate through the extensive cast biographies, interesting featurettes, and a wealth of computer features. The highlight of this disc are the two intriguing audio commentaries. The first track features director Stephen Hopkins (The Ghost and the Darkness) and writer/producer Akiva Goldsman, and they both delve into the origins and production of the film. Both men impressed me with their candid discussions about segments of the film that didn't work. There is little of the ego boosting that sometimes exists within feature commentaries. Instead, they explain their goals for the film, and then discuss whether or not it succeeds. Hopkins stresses the tight nature of their schedule, which caused some visual effects to remain unfinished. Goldsman even lays out the main story for a possible sequel (which probably is not going to happen). The second commentary track features the technical masters of the film, lead by Visual Effects Supervisor Angus Bickerton. Recorded separately, it contains a wealth of information about the extreme amount of work that went into each effects shot. This track complements the first one nicely to provide a complete picture of the production of the film. The extras also include two interesting featurettes that offer even more supplementary information about the film. Building the Special Effects takes an overview of several of the major effects shots, including the opening bubble fighter scene and the creation of Spider Smith. The Future of Space Travel delves into a brief scientific discussion on our future in space while discussing the possibility of ideas in the film becoming reality. It is impossible to describe all of the extras available on this disc, but several warrant mention. Fans of the original television series will love The Television Years, an area containing cast biographies, a complete episode synopsis, and a question and answer session. Nine deleted scenes are also included with a brief text introduction for each one. The most notable additions feature a "Big Blorp" discovered by the Robinson women near the end of the film. It adds more relevance to the Blorp character and gives Penny a larger role in the story. The Production Design section goes well beyond the usual crudely drawn storyboards. Its pictures offer a full-color, detailed look at the initial concept for key sequences in the film. The DVD ROM portion of the disc provides even more opportunities for fun and insight into the film's production. It contains the original screenplay—which you may view alongside scenes from the film—five entertaining interactive games, and direct links to official web sites. New Line's Lost in Space DVD ranks with the premier releases due to its multitude of innovative extra features. Unfortunately, the actual film fails to measure up because of a disconnected story and thin characterizations. The disc does provide an in-depth and interesting overview of the production of an ambitious but deficient film.